Master bedrooms and bathrooms that are joined are becoming much more frequently installed in new homes. These bed and bath combinations can be styled in numerous ways but should have at least one point of connection. This helps transition from one use to another, while still providing a sense of continuity to the home. Painting the walls of both rooms the same color can help provide a sense of unity, particularly if the rooms are separated by a narrow doorway. If the wall color in one room is so dramatic that to repeat it would be too much for the space, consider using the same flooring through both rooms. While hardwood and carpets are not great choices for bathrooms, stone or porcelain tile floors can be used in bedrooms to great affect, particularly in both modern and old world style homes. Remember to keep the size of the floor tiles large to avoid a busy floor. The pattern of the tiles can shift from one room to another if some additional detail is desired. One way to open a bedroom up onto a bathroom without creating a totally open floor plan is to use arches in the doorways. This helps delineate the two spaces, while keeping them open to one another. Using the repeating shape of the arch throughout the bathroom helps to cement the design and give a sense of continuity to the space. For large bedroom-bathroom suites, consider opening the two rooms up to one another to create a spacious floor plan and relaxing atmosphere. In this case, be sure to create a focal point within the bathroom that can be easily seen from the bedroom. 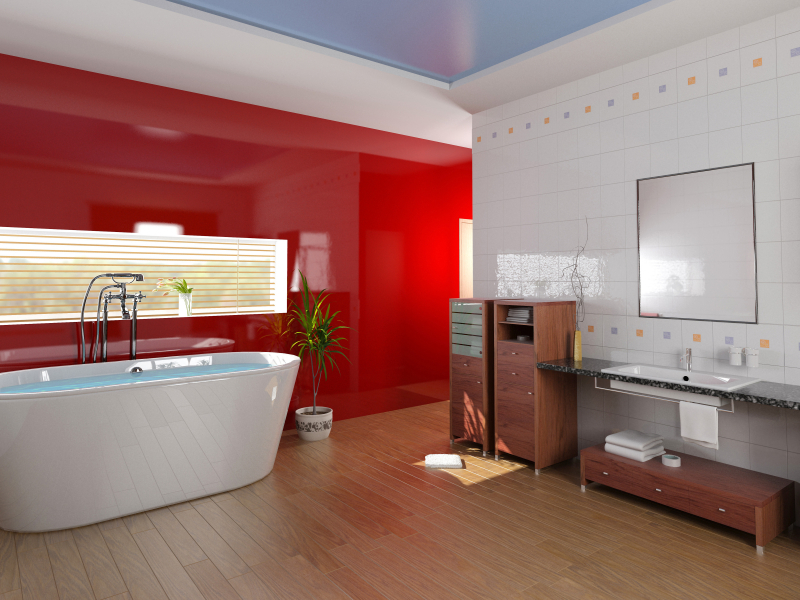 A stand alone tub in the center of a room is the perfect way to create a spa-like feel to the area. Lots of textures and modern lines help to keep the two rooms working together well. If the bedroom is dramatic in color, it helps to tone down the bathroom a little to give the eye a resting place. It does, however, help to add just one small pop of the dramatic color against the calmer bathroom palette. A curtain above the tub in the same color as the bedroom walls is the perfect way to offset the textured and cool slate tiles. Neutral colors are frequently used in bathrooms, but can start to make a bedroom feel drab if carried throughout both spaces. If you shy away from color, consider adding some small amounts of black to an otherwise neutral design in both spaces. Black glass or stone tiles can dress up an otherwise vanilla bathroom while fabrics can add a dramatic flair to the bedroom. Remember that the master bathroom should be a reflection of the rest of the house, even if it's separated from it by the master bedroom. This log home bathroom features a rustic vanity and lots of natural material to tie it back to the rest of the home, while the wall color helps anchor it to the bedroom. If your bedroom is painted in a bold color which would overwhelm a small bathroom, consider using it as an accent while keeping the other colors neutral. This mosaic-covered bathroom uses the bedroom color at the tops and bottoms of each column, bringing the color in without overpowering the room. If your master bathroom and bedroom open up to one another, consider mimicking the shapes in both rooms for a sense of continuity. In this bedroom/bathroom combination, the vanity and night tables have the same basic shape and hardware, repeating the pattern in both rooms. Different colors help to separate the areas and define them. If you'd like a little separation between the master bedroom and the adjoining bathroom, consider putting a dressing room between them. The dressing room acts as a buffer between the two spaces, allowing for completely different designs in the two spaces, while also providing additional, built-in storage to both areas. Open up the space between the bedroom and bathroom, while making the bathroom seem much larger with a mirror wall. This wall gives some privacy to the bathroom user from the bedroom, while reflecting the rest of the space and visually opening the area. Having an accent wall in your bedroom or bathroom doesn't mean having to use a bright or bold color. This dark taupe wall adds a sense of richness and luxury to the bedroom area, while setting up the palette for the bathroom with quiet neutrals. Neutrals in the bathroom area can be particularly luxurious when they are introduced through the materials. This marble bathroom uses a textured wallpaper that picks up the darker color from the floor and also ties back to the bedroom. If there's space between the master bedroom and bathroom, consider turning this area into a separate sitting room. A sitting room can be a great transitional room, design wise, between the two spaces, incorporating colors, textures and materials from both areas. The tray ceiling in this bedroom provides the inspiration for the rest of the room's design. Picking up and repeating the shape throughout the rest of the room, while highlighting it with white paint gives the room both a contemporary and warm, traditional feeling at once. The same type of continuity can be achieved in the bathroom by using one material - in this case Bianco Venetino marble - throughout the entire room. The repeating shapes of rectangles in the tiles, sinks and counter help to further carry the design. If there is a rug in the master bedroom that adds color, texture or interest to the space, consider duplicating the look in tile in the bathroom. Tile rugs can be simple, created out of large tiles in two colors, or they can be dramatic mosaic creations. In either case, they focus the eye and add interest to an otherwise utilitarian space. Your master bedroom and bathroom should be your sanctuary. Make sure you invest the time and effort into them necessary to make your dreams come true.